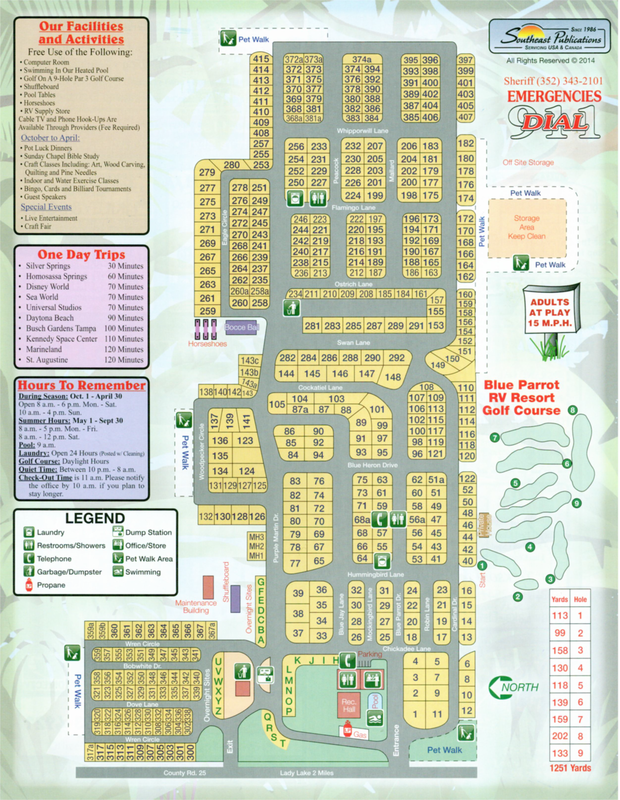 Join us at the Blue Parrot RV Resort and enjoy all the best of Florida RV living. Tranquility is the best description of our resort in central Florida, with convenience running a close second. It's an easy drive to the major Florida attractions, including Walt Disney World, LEGOLAND, Busch Gardens, Silver Springs and Daytona Beach, but you'll think we're in a world apart as you savor our peaceful surroundings. Lots of activities and sunshine await... we hope to see you soon! Written leases are required on all 6 + 6 and yearly rents. All sites are complete with water, sewer and electric service. Residents are billed by Duke Energy for electric service. ​Propane, cable TV and telephones available. Extra person fee: per night $3.00; per month $40.00. Rates are based through April 30, 2019. For additional pricing information, please call us.